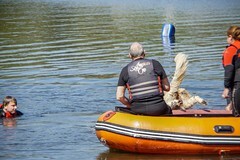 Dog harness or buoyancy aid (you will need one of these if you decide to test your dog). Your NNC membership card (after your taster sessions, you must show evidence of your membership for insurance purposes). We usually meet at 10.30am, and finish around 3.30/4pm with a break for lunch. Each training session is £3 per dog, which covers running expenses for fuel and other club costs. None of our members take any money for training. This is because we are all Newfy enthusiasts who love training our dogs, and helping others with their dogs. You do not need to commit to a certain number of training sessions: you can come to one a year, a month or every week, but all we ask is that when you do come to training, you help set up, pack away, and help train other dogs. We are a great team at Rother, and we also pull together to put on tests, demonstrations and other fundraising events. 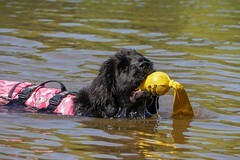 Most of our members train for the NNC water tests, which runs from Sections A through to E. It feels great to work towards something with your dog, and even better when you achieve it! However, we welcome members who don’t wish to test, though you would still be helping other members to train their dogs for tests. We also have fun training our dogs for fun elements for public demonstrations, though these tend to build on the test elements. You can read more about water training and tests on the NNC website.